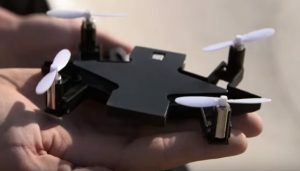 Selfly is a phone case that works as a drone. Precisely, the 8-megapixel selfie drone is piloted with one’s phone and works as an extension for the phone camera. The Detachable Flying Camera has been designed for aerial self-portraits and can be controlled via Wi-Fi. Selfly captures high-resolution photographs and full HD video at 30fps and sends them directly to the device for sharing. Founder and CEO, Dr. Hagay Klein quoted that the app will have onscreen control sticks as well as automatic piloting options to get specific shots. The app is developed as an open source so that others can also develop for it. Selfly actually flies itself, you don’t need to fly it!